Speedy the cheeky house bunny: Tuesday playday!updated! Had a little trouble posting this video as youtube is playing up and I can't get this to play after up loading it so I had to do this via Google plus but the quality isn't as good,silly gremlins!I managed to access the youtube version and get it working Yay! Oh Speedy. Watching you running around the house made Mommy so very happy. OMG! Speedy, you´re amazing cute!!!! You are just a armful of love. He thought maybe his Mummy wanted to go in there, which is why he went that way, but then when it turned out she didn't want to, he thought he'd go inspect the laundry, which was in obvious need of a bunny's inspection she it was just hanging around drying without any rabbit fur to be found anywhere on it! How adorable...I love how you take those stairs Speedy! OMD your fluffy bunny bum going down stairs Speedy. BUTTLICIOUS. Have a terrific Tuesday. Wow, you really hit those stairs on the hop! I like how you faked your peep into opening the door when you were really just looking through. BOL Gotta keep them guessing. Love how you get the run of the place. speedy...ya noe, if yur mum wanted ta reeeeeeeeely bee nice... her wood carry ewe down de stairs...then ewe wood have all yur energeez ta dee vote ta snackin on fruitz N stuff.....mite wanna haza talk with her :) !! I agree with you Speedy. Doors MUST be open ! Speedy! You are so adorable!!! I could watch you hop around all day! You have the coolest markings to! I have to tell you, Speedy is SERIOUSLY one of the cutest bunnies I have EVER seen. Actually he is the CUTEST! Love this! You're having so much fun, Speedy! Hey speedy....was there something scary outside that door... it sure did look nice out there. I waso tickled to see you hop down the stairs!! Looked like you'll have fun! Doing those stairs like a champ! I'm like you, I make mummy go downstairs then I don't go out BOL. Gotta keep them moving, right? Speedy you are just adorable. You are very fast. 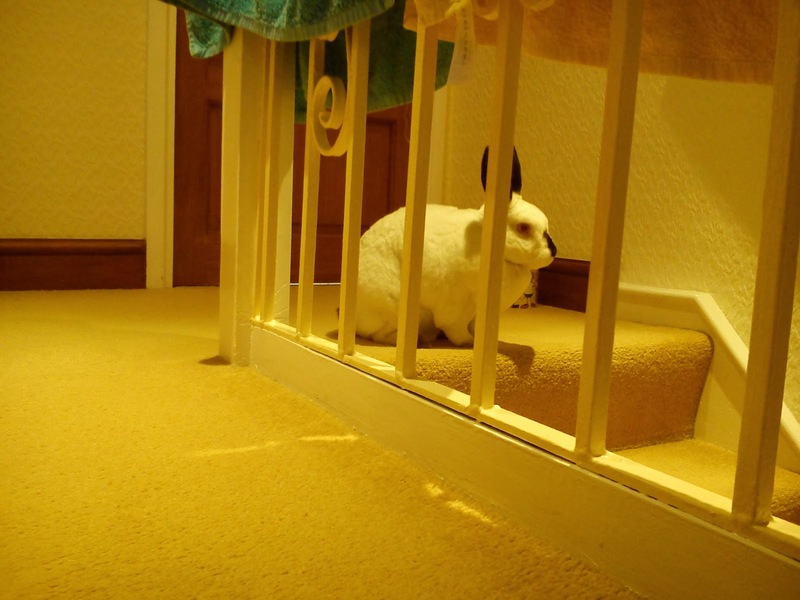 Preshuss Speedy ya lookz adorable hoppin down da stairz n checkin fingz out...we cuud watch ya all day! Today I took over My Three Moggies! Look what two Blondz gave Me! The crazy things that make Speedy who he is! Awards of December 2013 and a Disapproving Bun!